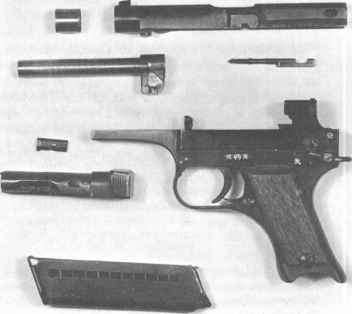 The three standard military pistols used by the Japanese, all of which were of 8 mm. caliber, were the Nambu (designed in 1904), the Nambu Type 14 (1925), and the Nambu Type 94 (1934). A 7 mm. nonstandard type, to be discussed later, was also used to some extent by officers. Japanese pistols naturally are marked in Japanese, either in words or symbols (the latter being used to designate arsenals). The Japanese characters appearing on the right side of the receiver on the Nambu (1904), reading from left to right, stand for the words Nambu Shiki (meaning Nambu Type or Style). Those appearing on the left Side of the receiver on the Nambu Type 14 (1925), reading from left to right, Stand for Juyonen Shiki (meaning 14 Year Type), while those on the Nambu Type 94 (1934), reading from right to left, Stand for Kyuyon Shiki (meaning 94 Type). No type (or model) designation was given to the first Nambu, but, as it was designed in 1904, it seems proper to refer to it as the Nambu (1904) to distinguish it from the later types. These later types were given designations that need Some explanation. The reign of the Japanese Emperor preceding the present Emperor Hirohito was known as „Taisho." He took the throne in 1911, so Type 14 (1925) means the „Type of the 14th Year of the Taisho reign" (i.e., 1911 + 14 = 1925). Hirohito became Emperor in 1925, his reign being known as „Showa." Thus guns bearing the date (right hand Side) 18.11 were made in the 11th month of the 18th year of Showa, or November of the year 1925 + 18 (= 1943). The entire name of the original Nambu pistol is (from the Japanese characters) RIKU SHIKI NAMBU KENJU (meaning, Army Type Nambu Pistol). The characters for the Nambu Type 14 (1925) Stand for KENJU SHIKI 14 (1925) or Pistol Type 14 (1925). The Nambu Type 94 (1934) is named according to a different system. Previous to 1926 the Type (or Model) number of weapons and other equipment was indicated by the year of the reign in which the model was adopted, as explained above. From 1926 to 1940, however, a model was given a number derived from the assumed date of the founding of the Japanese Empire. The last two digits were used to designate the model. Since this particular model was adopted in the Japanese year 2594 (our year 1934), the designation Nambu Type 94 (1934) was assigned as official nomenclature. Nambu (1904)-The first self-loading pistol used by the Japanese was designed by General (then Major) Kijiro Nambu in 1904. This pistol is frequently referred to as the Model 14 Nambu; but this is erroneous as there was never any Such official designation. In its original form it had the designation Riku Shiki Nambu Kenju and was usually referred to Simply as the Nambu. Just when production began is not known, but it appears to have been around 1906. It was manufactured by a firm directed by Major Nambu. Officers of the army were allowed to purchase and carry it, though noncommissioned officers were required to carry the Mod. 26 9 mm. revolver. This original manufacturing company continued operations and by the time of World War II was called the Kokura Rikugun Zoheisho, of Tokyo. It was also known as the Kayoba Factory. The Nambu was also made by the Tokio Gas and Electric Co. about the time of World War I. AS made by this firm there were some minor variations of construction and this firm used its own numbering system, Starting with No. 1. These pistols can be identified by the presence of the symbol used by the Tokyo Gas and Electric Co. This original model had a grip safety (omitted in the later model) but no mechanical Safety (present on the later model). It had a Safety device which prevented firing until the breech is fully locked in position, i.e., an automatic disconnector. It also had adjustable rear sights, which were omitted on the later model. AS originally made the pistol was provided with a leather or wood case-shoulder Stock which could be attached to the grip frame to convert the pistol into a carbine, a feature copied from Mauser. As the case was in itself too Short there was present a telescopic extension which could be pulled out to give the necessary length. Not all of the original Nambu models had this feature and it was given up when the later model was produced. In both models the bolt remains in the open position after the last Shot is fired. Nambu Type 14 (1925)-In 1925 the Japanese Army adopted a modified and improved version of the earlier pistol, and this was designated the Kenju Shiki 14 (Pistol Type 14), to which (1925) was added for the benefit of those not understanding the peculiar system of numbering used by the Japanese. Manufacture of this pistol was carried out by Several government arsenals other than those mentioned, among which were Nagoya Rikugun Zoheisho; Nambu Seisakusho; and Matsu Zoheisho, of Tokio. The Type 14 (1925) will be found with both Army and Navy markings. A variant form incorporated a spring-holding device for the magazine and a considerably enlarged trigger guard to facilitate the introduction of a gloved finger. The original, rather small, trigger guard had been found to be too Small for winter operations. This improvement was made Sometime in the late 1930's. Nambu Type 94 (1934)-The Type 94 pistol was designed by Nambu in 1934 and was intended for commercial Sale, particularly in South America and other countries having many Japanese residents. It was first designated as the Automatic Pistol Type B and was made at the Nambu factory. When World War II began it was adopted for military use and production was taken over by Government arsenals (Fig. 177). The pistol is poorly designed and not well made. In addition it is a very dangerous weapon as the sear is exposed and a slight pressure on this, when the pistol is cocked, will cause the weapon to discharge. This same feature is present in the Baby Nambu as well. Weapons which have features such as this are very dangerous indeed in the hands of persons who do not know the hazards involved in handling them. Fortunately, ammunition for the 8 mm. Japanese pistols is difficult to get, and for the 7 mm. it is impossible.